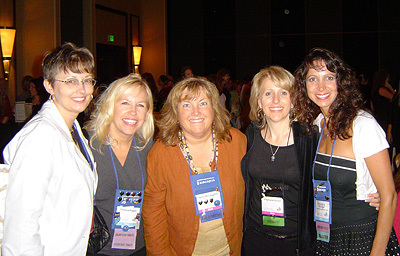 Terry and friends at the Desert Dream conference in Scottsdale, Arizona, April 2006. 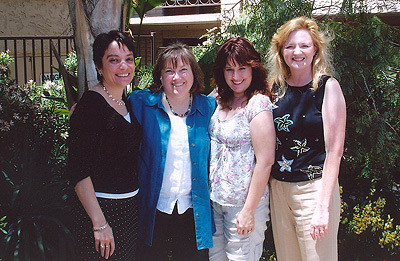 From the left, Harlequin Superromance author Anna Sugden, Terry, Harlequin Blaze author Tawny Weber, and Harlequin Medical Romance author and fellow Noodler, Janice Lynn. 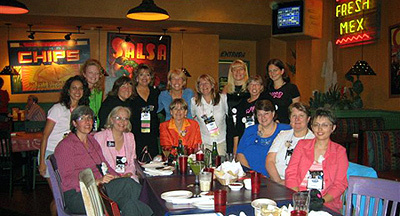 Terry and fellow Noodlers enjoy a pre-conference dinner in Atlanta, July 2006. 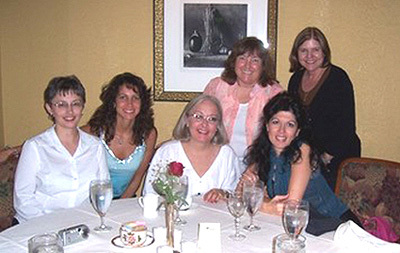 From the left, Harlequin American author Trish Milburn, Golden Heart finalist Priscilla Kissinger, RITA-winning Bombshell author Stephanie Feagan, Terry, award-winning Superromance author Anna DeStefano, and RITA-winning Mills & Boon author Diane Gaston. More Noodlers pose at the reception for RITA and Golden Heart finalists in San Francisco, 2009. From the left, multi-published author Trish Milburn, NYT and USA Today bestselling author Theresa Ragan, Terry, RITA finalist and author Stephanie Rowe, and Golden Heart finalist Priscilla Kissinger. One of the joys of Terry's life is her membership in the Wet Noodle Posse. 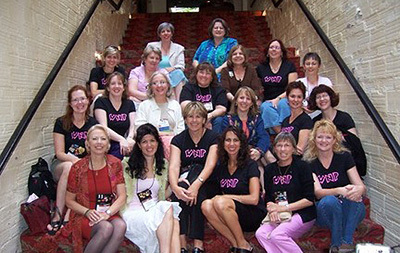 The Posse formed in 2003, when its members finaled in Romance Writers of America's Golden Heart contest. They didn't merely keep in touch after their contest experiencethey became as close as sisters. How did they come up with the name? One of the members doubted her writing ability, and the rest of them threatened to get together, hunt her down, and beat her with a wet noodle. 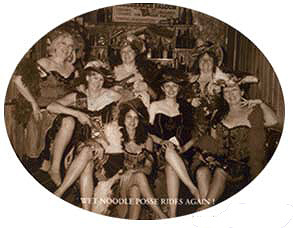 Support and sympathy, shared sorrows and shared successesthe Posse members are always there for each other. Check out their blog at wetnoodleposse.blogspot.com. Terry's Small-Town series gets repackaged for the UK as Special Moments and Cherish titles. Maybe, Baby appears in French as Nos couers enlaces. A Perfect Stranger appears as Un extrano in Spanish-speaking countries. In French, it's Des baisers interdits. When it was released in the United Kingdom, Make-Believe Cowboy became Millionaire Cowboy Seeks Wife. Jack Maguire is Un visiteur à Carnelian Cove in the French translation of A Small-Town Temptation. Place all the ingredients in a food processor and pulse until a coarse spread is formed. Spoon over crackers or toast. Heat the oil in a saucepan and add the garlic. Cook the garlic for just 30 seconds, and then add the vinegar, preserves, chicken stock, salt, and pepper. Simmer until the sauce reduces by half, about 15 minutes. Remove from the heat and whisk in the cold butter, stirring constantly until the butter has melted and the sauce is glossy. Sometimes Terry will thicken the sauce by spooning corn starch into a small jar with a little extra chicken stock, covering the jar tightly, and then giving it a good shake to dissolve the corn starch. She slowly pours the corn starch mixture into the pan, whisking constantly, until the sauce has thickened to the desired consistency, before adding the butter. Terry thinks this may be the perfect appetizer to take to a party: it's delicious, ridiculously easy to make, and looks incredible. Blackberries add shine during the summer, and raspberries add just the right touch of red during the winter holidays. Don't forget to pack a spreader and some crackers for serving. Roll the log-shaped chèvre in sunflower seeds, pressing lightly, until the cheese is nearly covered with seeds. Place in the center of a pretty serving platter. Pour honey over the cheese log until the honey begins to drizzle down the cheese and spread along the plate. Gently press pairs of mint leaves into the honey at each end of the log and at intervals along its sides. Arrange berries over the mint leaves, tucking them against the cheese, until the berries and leaves resemble tiny floral arrangements.